Rock Lakes is situated in Migné - part of the Brenne National Park, known for taking care of natural habitats, specific species of wild plants and animals that are threatened throughout France. The main lake is 13 acres and has 9 swims, 2 of them being doubles. The lake holds many big, beautiful carp that are approaching 50lbs, a Linear and a Common/Koi. As of August 2011 the biggest catfish thats been out is 195lb. There are many catfish over 100lbs in there and lots that are approaching this. Rock Lakes is approximetly 10 minutes from Supermarkets, Petrol Stations and Bars. Its 20 minutes away from the historic town of Chateauroux, where there is plenty to do in and around the town. We intend to make FISHABIL"The Premier" angling centre, once again, by ensuring quality fish stock and great value accommodation. The centre has incredible pedigree with over 500 years of history associated with it. In the past it has held:- 6 major European matches, 2 World Carp Cup and 2 European Carp Cup Tournaments and in recognizing the lake's excellent fish breeding conditions we intend to maintain and nurture this very high standard. 8 world records have been set and approved by the international sport fishing association at Lake Fishabil! Our goal is to bring the accommodation and facilities up to the same excellent standard of the fishing whilst ensuring good value for money. Southwest Brittany; nearest village is Loscouet-sur-Meu; nearest port  St. Malo travel time from port to lake approx. 1hr. 85 acres; set in 200 acres of parkland, depths  11ft at dam, 3-4ft in margins. Over 50 tonnes of carp to over 60lb; common carp to 60lb; sturgeon to over 60lb. are being refurbished over the winter. 3 LAKES, 3 DIFFERENT EXPERIENCES! Exclusive Angling Holidays comprises three lakes set in 25 acres of Chestnut woodland, in the Dordogne region of France, just 40 minutes drive south of Limoges airport. in the popularity of Carp Angling. We were one of the first companies to begin offering holidays abroad that specifically catered for Carp and Catfish anglers and offered the quality of fishing only available on the continent. Since then the company has gone from strength to strength, providing thousands of anglers with some of the best fishing of their lives! of catfish, with the average weight (excluding offspring) being 54lbs and the largest just touching 114lbs. 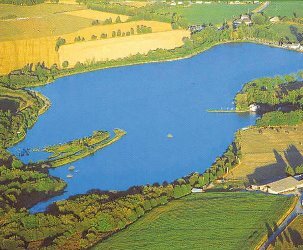 Vert is a smashing 1.5 acre lake cut out of the surrounding woodland, and makes the perfect lake for a first France trip. also present in large numbers with the largest being 36lb+ there is always a personal best sized fish out there.